To celebrate the Year of Italian Food 2018, announced by the Ministry of Cultural Heritage and Activities in collaboration with the Ministry of Agricultural, Food and Forestry Policies, the Puglia Museum Hub has launched “Food, Ritual, Conviviality”. The initiative, inaugurated on 21st of June 2018 with the opening of the photographic exhibition entitled “Can food be art? Photographs by Salvo d’Avila, curated by Lia De Venere”, aims at promoting an organic journey to popularise the role of food as a key element of the Italian intangible cultural heritage. Museo Archeologico Nazionale di Altamura (Altamura National Archaeological Museum), in addition to the permanent exhibition “Preistoria del cibo. Alle origini del pane” (“Prehistory of food. The origins of bread”), a new itinerary was set up, “Dal pane al vino” (“From bread to wine”): a history of food from the Stone Age to the Middle Ages through archaeological findings exhibited and meticulously illustrated via QR code. The halls of Altamura Archaeological Museum are also hosting a photographic exhibition of works by Piero Amendolara, award-winning reporter both at on a regional and national level, who celebrates the Murgia region and its intangible cultural heritage. A series of initiatives have been organised by COMUNICÆTICA MADEINMURGIA.ORG, the Puglia and Basilicata Associazione di promozione territoriale e culturale (Regional and cultural heritage association). Among them, the meetings “La vite nel tempo” (“The vine through time”), focused on the close links between wine and the region, and “La filiera della canapa” (“The hemp processing line”), to discover its multifunctional use and its relevance for the Mediterranean diet. The Museo Archeologico Nazionale “G. Andreassi” (“G. Andreassi” National Archaeological Museum) in Egnazia has organised the temporary exhibition “Antichi rituali della tavola” (“Old table rituals”), a collection of grave goods including a banquet set dating from between the 5th and the 4th centuries B.C. 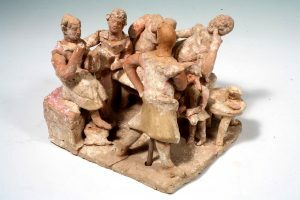 A clay group of banqueters is also featured in a 3D version and a digital storytelling: a web apps and webware narration, inspired by the representation of the renowned clay group from Egnazia, and expands on the subject of banquets and the dining table of the Greco-Roman period. For the European Heritage Days planned in September, within the walls of the Swabian Castle at Gioia del Colle, the play “I giorni del grano” (“The days of wheat”) will be performed in collaboration with Lecce’s Koreja Theatre Company: an innovative and multisensory journey into the bread making tradition of the Murge region. The Castle at Gioia del Colle is also hosting a temporary exhibition focused on the banquet set in art, films and theatre with the display of works by Giorgio de Chirico, on loan from the eponymous Foundation. The Archaeological Park of Monte Sannace is hosting furnished rooms of a Peucetian home: a typical building style dating back to the Archaic period and adopted extensively in the 4th century BC. In the autumn, an exhibition of fish plates and pottery illustrated with banquet themed designs, originating from the Museo Archeologico Nazionale Jatta (Jatta National Archaeological Museum) in Ruvo di Puglia, wraps up the archaeological section of the “Food, Ritual, Conviviality” project. Castel del Monte will host “Convivium – Stupori e sapori alla tavola di Federico II” (“Convivium – Surprises and flavours at the table of Frederic II”), with historical re-enactment of the Frederician period providing the backdrop to displays of premium wine and food offerings of the region. A collaboration with Associazione ETRA (ETRA Association) sees the involvement of local papier maché artists offering hands-on workshops dedicated to food, promoted by the Hub in the entire Region. An exhibition dedicated to the works of contemporary, hyper-realists and pop visual artists at the Swabian Castle of Bari will wrap up the event. The Puglia Museum Hub wants to actively involve in the project also the region’s Museums – among them for example il Museo del Grano (Wheat Museum) in Cerignola – dedicated to the subjects of the event. Worth mentioning among the programme’s series of seminars and study days is “Il cibo nell’arte occidentale dall’antichità ad oggi” (“Food in Western art from antiquity to the present day”), a talk presented by Lia De Venere, art historian and curator of contemporary art exhibitions. Also relevant to the subject is a talk on the protection of the environment and biodiversity by Giuseppe Giove, Commanding General of the Carabinieri, Forestry, Environmental and Agri-food protection for the Emilia Romagna region. The meetings with Mariastella Margozzi (“Futuristic cuisine”) and Renato Morisco, renowned food expert and technologist from Bari will complement the programme. A comprehensive press release of all events and initiatives is attached.